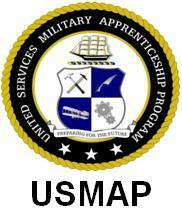 The United Services Military Apprenticeship Program (USMAP) is a formal military training program executed by the Center for Personal and Professional Development that provides active duty Coast Guard, Marine Corps, and Navy service members the opportunity to improve their job skills and to complete their civilian apprenticeship requirements while they are on active duty. The U.S. Department of Labor (DOL) provides the nationally recognized "Certificate of Completion" upon program completion. Originally established in 1976 as a Navy program the three Sea Services merged into a single program registered with the DOL (N-93063) in April 2000. USMAP allows active duty members to complete a DOL apprenticeship program while serving their country. Registration of the National Apprenticeship Standards for USMAP with DOL for the military occupational specialties is mutually beneficial to the military services, to the individual service member, and private industry. Acceptance of registered military apprentices and skilled craft workers by private industry will enhance employment opportunities for military veterans, motivate military personnel to advance within their occupational specialties while on active duty, and provide a source of skilled personnel to meet national skilled work force requirements.